So you have a LinkedIn profile, now what? 1 - Make a profile. Your profile is very similar to a resume. Make sure you have all of your activities on your profile along with any jobs or internships. 2 - Get Connected! They make it easy for you by importing contacts from your email. 3 - Join Groups! Below is a snapshot of what groups I've joined. You can do searches for groups according to industries, interests, and obviously your university. Just make sure your profile is professional. Recruiters check out profiles on here (as well as on Facebook) so keep it safe! Once you get the hang of LinkedIn, you will be able to search for jobs or even Alumni that may be working at the company you would like to intern/work for. Good luck! 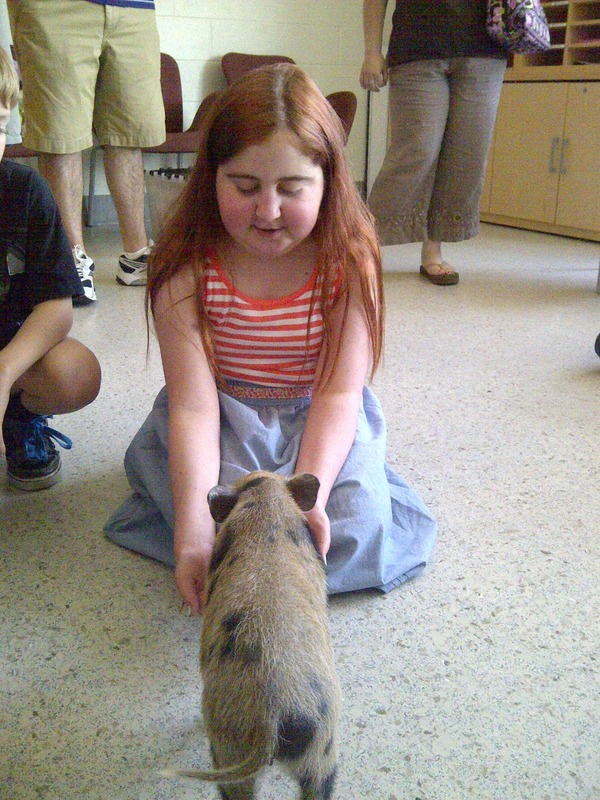 The following was written by a Hofstra Student who, through her time with Adopt a Dream (a charitable club run by students that grants wishes to terminally ill children), was able to fulfill a young girl's dream of owning a pet pig. In January, prior to the start of the semester, I contacted Michele Vernon of Sunrise Day Camp (75 Colonial Springs Road Wheatley Heights, NY 11798) for a candidate for Adopt a Dream during Spring 2012. She presented us with three candidates; from whom we chose a wonderful young girl, Cassandra Steinle. Unfortunately Cassandra has lung failure and only 15% lung capacity. Michele told me that her dream was to have a pet pig and at first all of our reactions were the same: "A pet pig? REALLY?" Turns out it was a very legitimate dream. After speaking both with Eleanore Steinle (Cassandra's mother) and Cassandra herself, we got an idea of what we wanted to do. Cassandra happily greets her new pet. One thing that makes Adopt a Dream so unique when compared to other organizations, is that we take the time to bond and get to know our dreamers. We never just hand over a check; we personalize each and every dream to include the dreamer, his/her family and the Adopt a Dream members. In March we had a breakfast in the Student Center with Cassandra, Eleanore, John Sr. (her father) and John Jr. (her brother) as our honored guests. At this breakfast we presented Cassandra with a one-of-a-kind hot pink wheelchair that members of Adopt a Dream personally designed and assembled weeks earlier - we call it the "Cassandra-Mobile" as embroidered on the back of the chair. After breakfast, a stretch limo transported the Steinles to the Museum of Natural History where they joined Adopt a Dreamers already present at the museum. Later that same day we went across Central Park to the Zoo where we saw peacocks, monkeys and polar bears (oh my!). All the excitement wasn't over yet: you can't go a full day without a celebratory dinner! Espresso Cafe at 1135 1st Avenue New York was able to provide a private dining room for the Steinles and 18 Adopt a Dreamers for a delicious dinner. The Steinles got to relax and think about the wonderful day they had in a limo ride back to Hofstra, but this was just part 1 of Adopt a Dream's journey with Cassandra. Everyone did their utmost to ensure Cassandra's dream came true! April 28th Hofstra hosted Relay for Life whereat Cassandra in her pink wheelchair was not only Adopt a Dream's guest of honor, but Relay for Life's guest of honor as well. To start off the night Eleanore and Cassandra were interviewed on WPIX; then Dwayne Lindsey (Adopt a Dream's Public Relations Chairperson) lead the Survivor Lap while pushing Cassandra; singing groups even came up and sang specifically for Cassandra. Earlier in the semester, Adopt a Dream hosted a Zumba event in order to raise money for Cassandra's dream, and we had a flash mob to advertise for it. We performed that flash mob dance at Relay and got about 50 people involved in it. This night was magical for Cassandra and her family as they got to see all the people that care for and about them. Cassandra's Dream was to have a pet pig and we didn't fall short. Three weeks after the semester ended, a bunch of members went back to Hofstra where we finally presented Cassandra and her family with "Oinkles Skittles" -- a mini pot belly pig. She flew here all the way from Minnesota from Misti Rose Farm. The smile on Cassandra's face when she laid eyes on Oinkles could light up the sky. Her smile is the reason Adopt a Dream does all we can, for children like Cassandra. 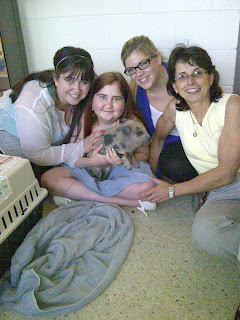 Along with her pig we presented her with our signature "DREAM" block. The day was quite successful and left us all feeling incredibly elated. Have you ever applied to a company or organization directly on their website? Did you fill out a profile and online application? Did you set up a username and password? Many applicants go through all of the above steps and in some circumstances, select what types of positions they are interested in or actually choose a job opening to apply for. However, many candidates do this once, and believe they are now "in the system." This may be a crucial mistake! I recently was working with a graduate who applied with an organization over a year ago, believed she was in the applicant pool, and never heard anything. This graduate was shocked when I showed her that simply setting up an account was not the only step! In fact, each time a new job opening was posted on the site, she had to log back in and reapply with her existing account! It even gave her the option to upload a new resume and cover letter. Unfortunately, this graduate missed out on many opportunities with this organization. First-Year Students! Begin Discovering Your Path Here At Hofstra With the Discovery Program! Summer is here and that means it is time to start planning the Discovery Program for the Class of 2016! We anticipate this year's Discovery class to be the biggest yet and we are hard at work implementing new initiatives.While a brochure was sent to each first-year student, myself and Discovery Graduate Coordinator Calla Hales attend the Parent and Family Orientation lunch as well as the Student Orientation involvement fair every week where students and their families can learn more about the program and ask any questions they may have. All information can also be found on the Discovery Program website. For those who are not familiar, the Discovery Program is a program just for first year students that allows them to arrive to campus five days before Welcome Week to do community service. The students are able to work with many different non-profit organizations including (but not limited to) homeless shelters, soup kitchens, local elementary schools, local civic associations, environmental agencies, and this year we are even volunteering with Habitat for Humanity! Besides students having the opportunity to give back to Hofstra's local community, it is a great way for first-year students to get acclimated to college life with a much smaller group of students with the guidance of an upperclassmen mentor, also known as our Discovery Leaders. The Discovery Program is a wonderful opportunity for students to hit the ground running, get involved early and make life-long friendships. Our past Discovery participants have excelled while here at Hofstra and are some of our best student leaders on campus. One participant described his experience last year. "[The Discovery Program] was absolutely heartwarming and life changing, thank you greatly!" The biggest change for this year is the revampment of the Discovery Program paths. Each participant chooses which path of service they would like to embark on during the program. The Compassion path has been changed to Community Empowerment, the Sustainability path has been changed to Sustainable Solutions, and we have added a brand new path this year called Social Awareness. Community Empowerment teaches students the importance of helping others and working to empower communities in need. Sustainable Solutions focuses on working with organizations that help encourage sustainability and educate students about environmentally sound practices. Lastly, Social Awareness works with organizations that promote social justice and activism, learning the best way to help your global community is to help your local community. 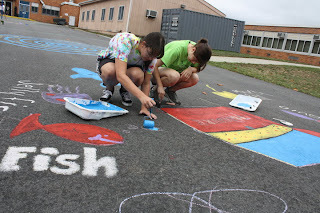 Each path features different service projects each day allowing time in the evening and on the last day of the program for students to share their different experiences. The Hofstra softball team watched batting practice from the field and were honored by the Mets in a pregame ceremony at Citi Field last night. 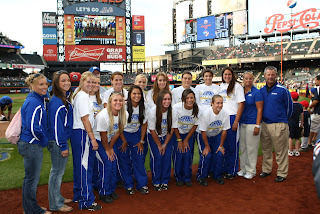 Most of the players and the entire coaching staff from Hofstra were recognized before the Mets-Orioles game. The Pride won the Colonial Athletic Association championship and the Los Angeles Regional en route to its first-ever appearance in the Super Regional. Hofstra finished the season ranked 16th in the final NFCA poll, the highest season-ending finish in school history. Hofstra players and staff had the chance to talk to Mets players and posed for pictures with third baseman David Wright, outfielder Kirk Nieuwenhuis and Mike Baxter. Orioles left-handed hitter Nick Johnson also posed for pictures with the team. Before the ceremonial first pitch, Hofstra posed for a group photo on the field and had the accomplishments from their 42-15 season read over the public address system. Junior Olivia Galati’s season was also highlighted to the crowd. Galati is the only first-team All-America in program history and set a school record with a 34-7 record and led all Division I pitchers with 17 shutouts and a 0.95 ERA. The pregame festivities also included Bubba Watson, the 2012 Masters champion, throwing out the ceremonial first pitch and Hall-of-Famer Tom Seaver posing with Johan Santana to commemorate his no-hitter earlier this month. For more on Hofstra Athletics, make sure to check out the new www.GoHofstra.com site that launched today. - If you're done with a task, be proactive and look for something productive to do. If there's nothing that your supervisor can give you, is there something you can do that can make his/her life easier? For example, AGES ago, when I interned at a local news network, I reorganized their videotape shelves. Yes it was a dirty job, but no one else was going to do it. They appreciated it so much, that at the end of the internship I was able to write a promo. Little deeds go a long way. - Schedule informational meetings with people that you would like to learn more about. Is there someone in your department that you are itching to meet or learn about what they do? Well go ahead and put yourself out there! Stop by his/her office and introduce yourself and make that connection. Afterwards, you can follow up and ask if they have 15 minutes to have an informational meeting. The worst that can happen is that they don't respond, but many people enjoy talking about their experiences (and themselves) and are willing to help out. - Be an active learner! Keep up the hard work and make sure you are a sponge, absorbing everything that comes your way! So tell us about your internship! Send us a tweet @Hofstra Career about your internship. Make sure you use #HUinterns. Best of luck and keep us posted! University Archivist Geri Solomon addresses the audience during the event's introduction. On the evening of June 6, 2012 Hofstra University played host to an array of artworks from sketches to photographs in PRIDE, an exhibition and reception showcasing the work of those in the Latino community who work in the background at Belmont, Aqueduct and Saratoga racetracks. "They are the behind-the-scenes stars. Far from the action of the track, we do not know their names nor hear their voices," said President of Backstretch Employee Service Team (B.E.S.T.) Paul Ruchames when describing the valiant work of backstretch employees, many of whom care for the champions and thoroughbreds we see on race day without ever capturing any glory for themselves. B.E.S.T. is an advocacy group that strives to provide health benefits, counseling and childcare among other necessities in order to - as they put it - care "for the people who care for the horses." One of the photographs from last week's exhibit: "Eye Contact of the Winner." Yet it was not merely the President of the honored group and the untrained artists whose work adorned the walls of Axinn Library's tenth floor alone who evinced their passion for the racetrack. Assistant Dean and University Archivist, Geri Solomon, introduced the event by conveying her own meaningful relationship with the sport: her husband was a hot-walker for the local stables and they even named their children after legends of the track. Mrs. Solomon's love of this historical sport echoes the way in which Hofstra has embraced B.E.S.T. and the community of backstretch employees whom the advocacy group serves. The collection will remain in the Hofstra archives and is still available for viewing on the tenth floor of Axinn Library on the south side of campus - and despite this past weekend's discouraging development regarding I'll Have Another's forced retirement, it's certainly a pleasure to see the heart of thoroughbred racing still beating strongly not only in the competitors but in the people charged with their care. It is Hofstra's hope to continue its relationship with B.E.S.T. and hold events like PRIDE on an annual basis. Now no matter where you are, what you're doing, or what kind of diet you have, summer usually means one thing: ice cream. Thankfully, Hofstra didn't forget that all-important aspect of the season and is providing summer students with free ice cream in Calkins Quad between noon and 1:30 p.m. on June 7. So, if you're taking a break between classes, or even if you're enjoying a nice stroll and just so happen to come across the free ice cream stands, stop by, grab a scoop and take a load off. It's summer after all! After you've indulged in some dessert, you may be thinking to yourself, "It is beach season...maybe I had a bit too many sweets." Not a problem! On June 13 at 5:45 p.m., the Office of Student Leadership and Activities will be busing 30 students from Hofstra's campus, down the block to the Eisenhower Park 5K run. The race itself will be taking place at 7:00 p.m. and only requires a pair of running shoes. Participation is free for the first 30 students to sign up. Afterwards, if you enjoyed the run and would like to keep sweating this summer, the races are a weekly part of the ongoing Summer Series organized by the Long Island Road Runners Club. **UPDATE** Unfortunately, today's 5K race at Eisenhower Park has been postponed due to the inhospitable weather. Check http://www.hofstra.edu/summerfun for updates. And after you've finished pounding the pavement, you can unwind from the rigors of studying for finals to enjoy some free food on the eleventh floor of Bill of Rights Hall at 8:00 p.m. on June 28. Take your mind off the stress of the final week of summer session and get in some quality time with your fellow students.